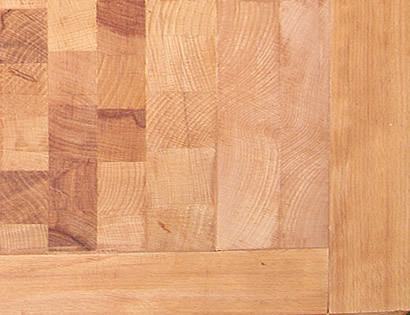 Butchers Block Restoration - Eagle Butchers Blocks; beautifully hand-crafted butchers blocks made from beech and pine, suitable for butchering, commercial kitchens or general kitchen use. As well as making high quality bespoke butchers blocks we are also able to repair and restore old or damaged butchers blocks. Quite a common problem with blocks if they are not maintained or they are particularly old is splitting of the endgrain wood and separation of the internal blocks this is generally caused by the block drying out. This can lead to the block not being fit for use and eventually falling apart. Deep knife marks and gouges are also a common result of constant use and can render the butchers block unhygienic and unsightly. 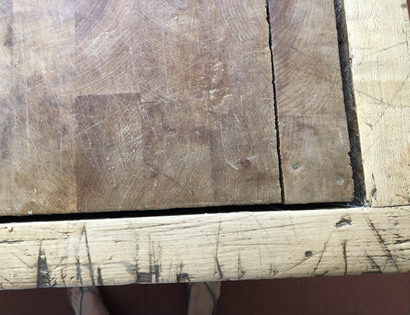 Depending on the nature and extent of the damage we offer a service after examining the butchers block that will reflect the work needed on each individual block. We are able to replace damaged or missing wood and filling any gaps with wood that is matched to the existing butchers block. We generally use end grain beech as this an ideal wood for butchers blocks. We can also replace the braces and and damaged screws or bracing bolts which often cause the collapse of the block if they have degraded. Your butchers block will returned to you ready for use again with no unsightly gaps, gauges or knife marks. It will be planed ,sanded and re oiled with new or cleaned metal braces. After this treatment your butchers block will last many decades to come.